Rearing grasshoppers requires a lot of attention in respect of nourishment, warmth and light. Therefore grasshoppers are a relatively costly product. 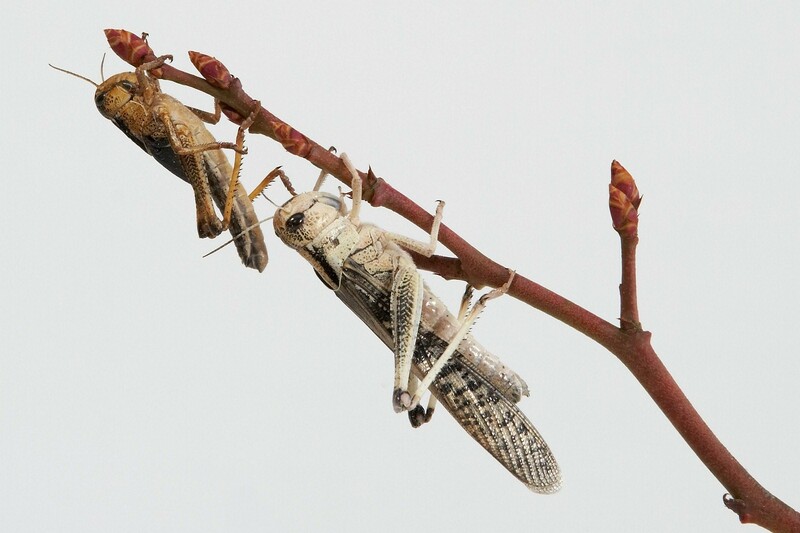 For many reptiles, birds, fish and various mammals – grasshoppers provide a high-protein delicacy. A big advantage is that grasshoppers, opposed to many other fodder insects, seek for sunlight, and as such become easy prey. Also available as a freeze-dried and frozen product. 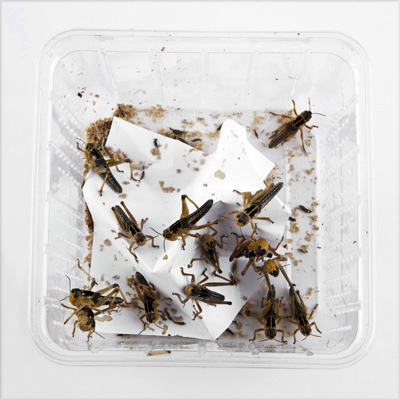 Grasshoppers in boxes can be kept in the delivered packaging. 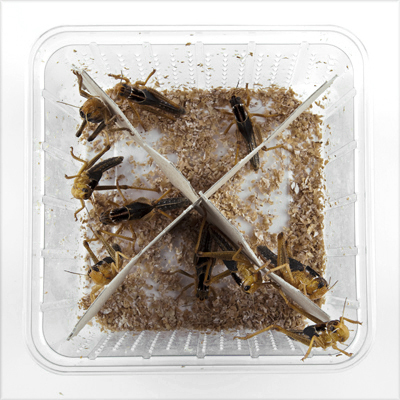 Should you order per cylinder box, we advice you to move the grasshoppers to a closed container with smooth sides (made of synthetic material or glass). Recommended measures of the container are approx. 30 x 40 cm (1 x width x height) per cylindrical contents. You can cover the container with a lid which allows ventilation. 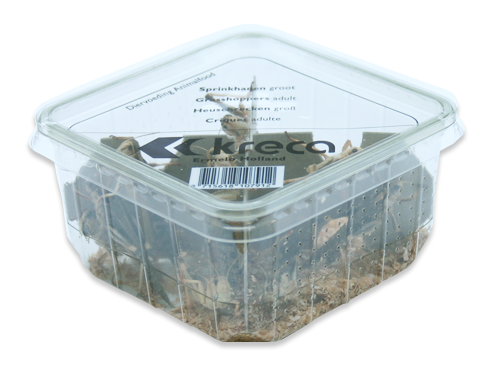 It would be wise to put some climbing material for the grasshoppers in the box, for example paper. Preferably between 15 and 20 degrees Celsius. Feed the grasshoppers with grass. 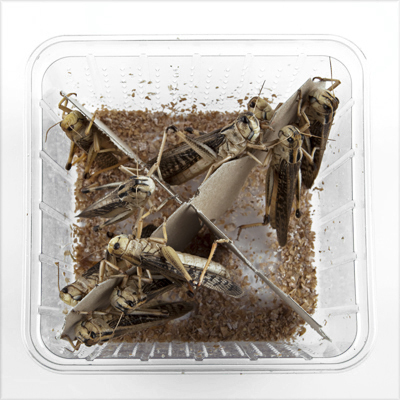 The greenery you feed them has to be unsprayed: grasshoppers are very sensitive to insecticides and other poisons and residues. Besides the greenery you can also feed them bran or a 7-grain mixture. In the wild insectivores enjoy a varied menu which supplies them with an adequate amount of vitamins and minerals. Almost all insectivores need calcium for their bone structure. Insects, also the reared ones, contain low calcium content. Therefore it is advisable to add a high-quality calcium preparation to the nourishment of your insectivore. Kreca has an excellent calcium- and vitamin preparations in its assortment.